Rulon Gardner, the Olympic gold medal wrestler is trying to shed pounds on "The Biggest Loser" even as his restaurant back in Wyoming tempts customers with a 24-ounce burger challenge. The hefty grappler, who stunned the world in 2000 by beating a seemingly invincible Russian, saw his weight nearly double to 474 pounds when he left the sport. 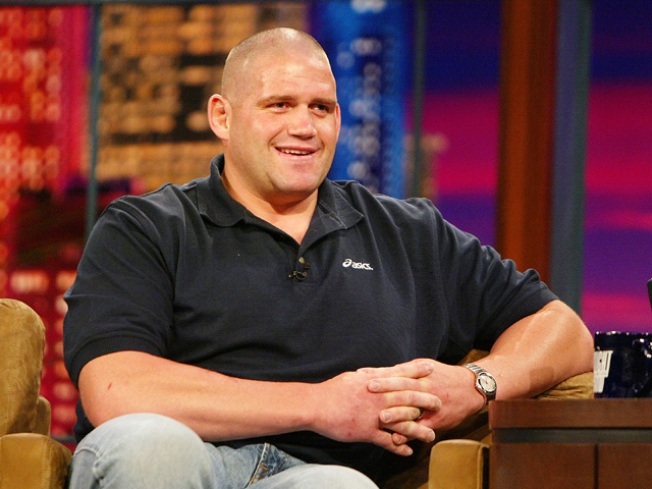 He's resurfaced on the hit NBC show, but in the interim, he opened Rulon Gardner's Burger Barn in Afton, Wyo. Customers there are confronted with the owner's challenge: eat the behemoth burger, a basket of fries and down a 44-ounce drink in 20 minutes. "It's fun," Gardner's brother and business partner, Russell Gardner, told the Casper Star-Tribune. "We make it light-hearted." Rulon Gardner, 39, who lives in Utah and lets his brother run the restaurant and nearby gas station, has consumed the six-pattie sandwich in just over eight minutes. But he hopes his days of eating like a rhino are over. A legend in his hometown, population 1,818, after his stunning defeat of Greco-Roman superstar Alexander Karelin, Gardner is slimming down fast on the TV show. He lost 32 pounds on the first episode to lead the field. He dropped another 27 pounds over the next two weeks and could soon be back under 400 pounds. "It's a good program, and it's something that he needed," his mother, Virginia Gardner said. "I'm sure that he will maintain his weight. That's part of his competitiveness." Selected Reading: The Associated Press, Casper Star-Tribune, The BiggestLoser.